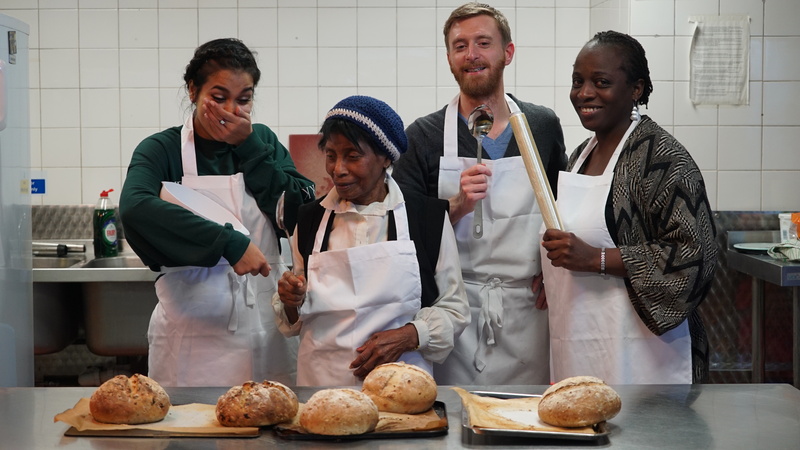 It was a great pleasure to be the baker for the Bread project as part of the Gratitude Enquiry. This part of the project took place at Oval House Theatre with participants from the theatre’s young artists and from the local group Stockwell Good Neighbours, alongside storyteller Surya Turner, Sue and myself. We baked different types of bread on three separate occasions, with each bake marking a development in our discussion and investigation into gratitude. We explored gratitude both in conversation and through the physical process of baking tailored breads for each other and exchanging them when they were ready to be eaten. The three types of bread were milk rolls; rolls with nuts, seeds and dried fruits and spiced buns. For the rolls with inclusions and the spiced buns, the bakers paired up and asked each other what they would most like in their breads, giving rise to interesting and personal combinations. In our final session the spiced buns were exchanged with messages of gratitude. Combine the flour, salt and yeast and any ground spices you are using. Add the water to the dry ingredients and mix to form a dough. Knead for 10-15 minutes until it passes the window test. Add any nuts, seeds and chopped up dried fruit. Knead for another minute to incorporate these well. Shape the dough into a ball and put into a bowl covered with cling film. Rest in a warm place for an hour. After an hour, take out the dough which should have doubled in size. Knock out the air and then shape into a ball again, trying to tuck the dough under as we did in the workshop, creating tension in the outside of the ball. Heat your oven to about 220C or gas mark 7. Place the shaped loaf onto a baking sheet lined with greaseproof paper which you have lightly rubbed with olive oil. Cover the loaf with cling film that you have also lightly rubbed with olive oil. Leave to rise for 30 – 45 minutes in a warm place, until doubled in size. When it has doubled in size, remove the cling film. Dust the top with flour. Bake in the oven for 20 – 25 minutes until crisp and golden. Combine the flour, salt, sugar, spices and yeast. Melt the butter and combine with the beer and water. Add the wet ingredients to the dry ingredients and mix to form a dough. Knead for 10-15 minutes until it passes the window test. Add any nuts, seeds and chopped up dried fruit. Knead for another minute to incorporate these well. Shape the dough into a ball and put into a bowl covered with cling film. Rest in a warm place for an hour. After an hour, take out the dough which should have doubled in size. Knock out the air and then gently shape into a sausage in order to slice it into rolls. Cut into 6 equal pieces and shape into rolls, trying to tuck the dough under as we did in the workshop, creating tension in the outside of the ball. Place the shaped rolls onto baking sheets lined with greaseproof paper which you have lightly rubbed with olive oil. Cover the rolls with cling film that you have also lightly rubbed with olive oil. Leave to rise for 30 – 45 minutes in a warm place, until doubled in size. When they have doubled in size, remove the cling film. Mix an equal quantity of hot water and caster sugar and brush each roll with it. Bake the rolls in the oven for 15 – 18 minutes until lightly golden. If desired you can get a shinier finish by brushing again with the sugar syrup half way through baking.